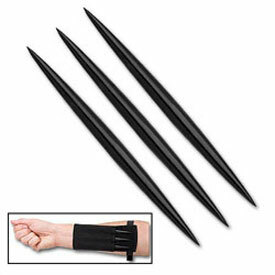 The Ninja Throwing Spike ranks up there with with the Ninja Star as one of the most popular throwing weapons in the martial arts. 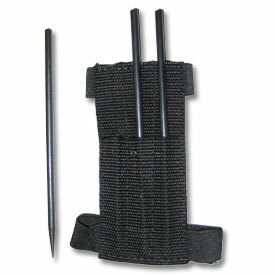 However, unlike the shuriken, the throwing spike (or dart) can be incredibly tricky to master. 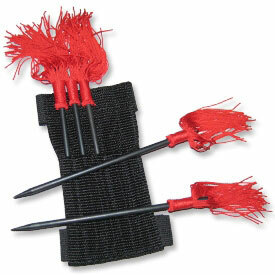 So if you consider yourself talented when it comes to throwing weapons, or if you're just an over-achieving novice, we definitely recommend that you pick up a set of throwing spikes! 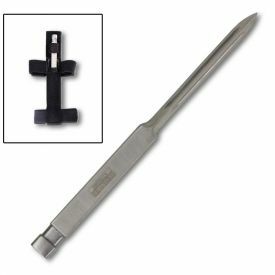 As you can tell from just a glance, there's (typically) only one pointy end to nail your target with. This means your throw better be a good one, because even a slightly off-kilter throwing spike is one that's destined for a quick journey to the ground. 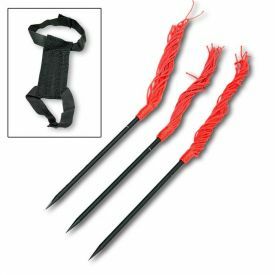 Some of our sets, like our Ninja Throwing Spikes with Tassels feature stringed tassels on one end, dramatically increasing the chance for a solid stick in your target. These are what we typically recommend for beginning throwers. Feeling like the ultimate throwing weapon challenge? 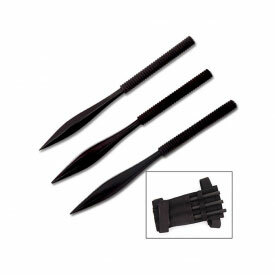 Take a look at our Black Dart Throwing Spikes. Their bulbous, front-heavy design can be a challenge to master, but oh-so-satisfying when they land in that target with their signature 'THUD'. New to the throwing weapon hobby? You may want to consider picking up a copy of The Complete Knife Throwing Guide. One of our top-selling weapons books, this will help give you an insight into the fundamentals of throwing weapons.